Our first impressions of Istanbul? A melting pot of…everything. 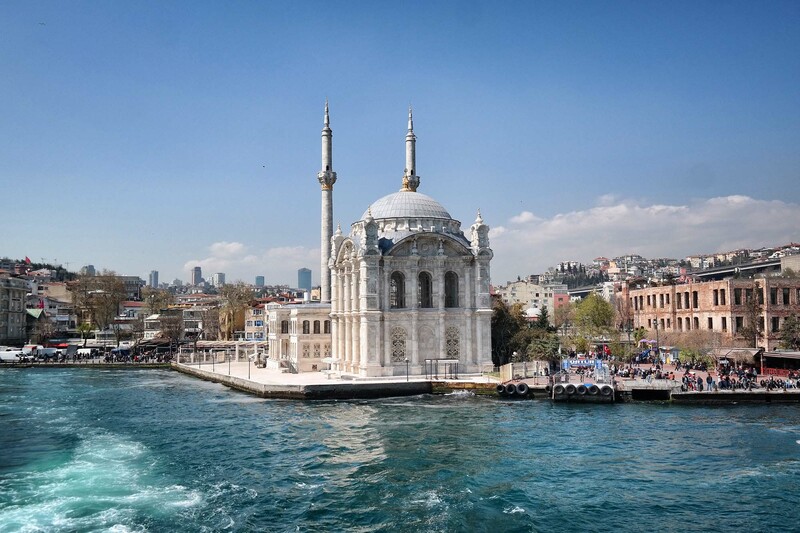 Istanbul is the only city in the world divided (or better: connected) by two continents (Europe and Asia), making it a unique spot where traditions mingle with modern trends and where the old blends in with the new. Istanbul is like bridge between East and West. Where to start when you want to discover this bustling, energetic city? Here are our 10 things to do in Istanbul. You’ve must have seen hundreds of pictures of the amazing Blue Mosque, the magnificent Hagia Sophia (or Aya Sophia), the fabulous Topkapi Palace… you just can’t do Istanbul without visiting these iconic sites. Lucky for us Istanbul makes it so easy to discover these sites: they are all situated in Sultanahmet, the oldest part of Istanbul. You might not see much of Turkish life here, but it’s a must go! Plan at least one or two days to visit the sites, there’s a lot to see and admire. And trust us: you’ll be blown away! Tip: Since you’re in the neighborhood, head west to tackle the Grand Bazaar, one of the largest and oldest covered markets in the world. It counts 61 covered walking street and over 3.000 shops, a dream for shopaholics (or a nightmare, you might get a shopping overdose or feel frustrated for not being able to visit all the shops, it’s really impossible). Haggling of course is a must if you want to buy something, so be prepared to spent quite some time in the bazaar if you actually plan to do some real shopping instead of just looking. The Bazaar attracts nearly half a million visitors a day, so you might find it bit too busy. If so, there are other – smaller – bazaars to discover. Especially the Spice Bazaar (or Egyptian Bazaar) is a fantastic place to soak up the typical Bazaar-atmosphere. Ever seen a stone column cry? Head down to Basilica Cistern – also known as the sunken palace or sunken cistern – and marvel at this little wonder. While the Basilica Cistern is not really one of Istanbul’s hidden gems – you’ll have to wait in line to get in – its fame is a bit overshadowed by the glory the Hagia Sofia, Blue Mosque and Topkapi Palace, and it’s surprising how few people know of this magical underground world. So what’s it all about? The Basicila Cistern is an underground pool – even fish swim in it! – and the largest of several hundred ancient cisterns that lie beneath Istanbul. It was constructed by the Romans in the 6th century to provide the city with drinking water. Centuries later people forgot about the cistern and the underground water palace remained undiscovered until a Frenchman visited Constantinople (the old name for Istanbul) in the 1500s. He was intrigued by the legends of underground temples and palaces and had heard strange stories of locals fishing from holes in their cellars. Our Frenchman did some exploring and investigation, and (re)discovered the Basilica Cistern. The underground water palace is one of the city’s most atmospheric sites. There are 336 pillars; two of them are decorated with the carved head of Medusa, one lying on the side, the other upside down (apparently for no special reason, the site was built out of old material from other buildings, the heads just seemed to have the proper size). And the Crying Column? It’s a column that looks like it’s crying when it’s wet. It was presumably erected in remembrance of the thousands of slaves who died during the construction of the Great Basilica. Trivia: Do you think the cistern would do great in a movie scene? You’re spot on! The mysterious site was used as a location in the James Bond-movie From Russia with Love (released in 1963, you can have a look at the scene here). In the Bond-movie the cistern is supposed to be under the Soviet consulate, but please don’t go looking for it, you’ll never find it: in real-life the consulate is situated in a completely other part of Istanbul. True, the fish restaurants under the Galata Bridge may come with an excellent view, but if you’re hungry to find out what the locals eat during a stroll around town, it’s the Eminönü fish sandwich boats you’re after. You’ll find them just at the foot of the Galata bridge, in front of the Spice Bazaar. Fisherman have been selling fish sandwiches here since, well, forever, and the fish sandwich is just what it is: a traditional bread with fish, green salad and onion. There are only a couple of boats selling these sandwiches and there’s always some – pleasant – chaos going on, but the sandwiches taste fantastic and the atmosphere is lovely. And it’s probably one of the cheapest meal you’ll ever have. And speaking of fish: the Galata Bridge is a popular fishing-hot spot for dozens of local men. From morning till evening they’re fishing, talking and well, just standing there and waiting for a big catch. Going to a Haman in Istanbul is an unforgettable experience, so get over the embarrassment of being naked in front of other people (mostly the men and woman have separate rooms and/or visiting hours, so why should you even care?). Be prepared for some serious steaming, washing and relaxing sessions. – The Haseki Hurrem Sultan Haman, built by the legendary Ottoman architect Sinan in 1556. After being a Haman, a prison (! ), a storage room for paper and oil and a carpet bazaar, it recently got renovated into a luxurious Haman, with 160 gold-plated bath bowls. – The Kiliç Ali Pasa Haman, also built by Sinan. It has a dome that is 14 meters in diameter and 17 meters in height. Here’s your chance to set foot on two different continents in one day. Istanbul is the only city in the world that lies on two continents, and they’ve made it really easy to jump from one continent to the other. Just hop on one of the Bosphorus-boats, sit back, relax and enjoy the cruise. Taking a cruise is a fantastic way to have a new perspective on the city, and when arriving on the Asian side, you’ll immediately noticed the difference between the two sides (the Asian side is definitely more traditional, and, well, more Asian of course). There are a lot of companies offering cruises on the Bosphorus (some of them with dinner and a show), but we went for short and simple and cruised with Şehir Hatları, Istanbul’s official ferry company. It offers three great Bosphorus tours: Short Circle Bosphorus Cruise, Full Bosphorus Cruise and the Full Bosphorus Cruise by Night (the availability of these tours changes according to the season, check out the website). You can find the Şehir Hatları Bosphorus lines on the left docks of Eminönü when coming off the Galata Bridge. Istanbul can be a very busy and stimulating city, and if you’re desperate for some peace and quiet (and if you have the time, this is a day trip if you want to do it right) you should consider visiting The Princes’ Islands. These islands are a chain of nine small islands in the Sea of Marmara and were once a place of exile. Today the islands are a popular getaway to relax and their main attractions are nature… and silence. Motorized vehicles are banned, and if you want to go from one place to another relatively quickly, you’ll have bike (easy to rent) or to take a horse-drawn carriage (our first choice of course!). Bonus: While riding your bike or feeling like royalty in your carriage, you can admire the typical architecture of the islands: fine wooden Victorian cottages. How cool is that? Only four of the nine islands are open to the public: Büyükada, Burgazada, Heybeliada and Kınalıada. Especial Heybeliada is worth a visit. It takes about 90 minutes by ferry to get there (check the timetables to go back!). Tip: In Büyükada you’ll find Hagia Yorgi, an old monastery built at 202 meters, the highest point in Istanbul and good for some spectacular views. As if Turkish food isn’t already fantastic (the ‘damage’ after our one week Istanbul was an extra 2 kilo’s, it still hurts! ), they had to throw in the some of the most tasteful and addictive sweets and pastries in the world. The two most famous examples are Baklava and Turkish Delights. The first one being a Middle East pastry made with layers of filo filled with chopped nuts and sweetened with honey (and it tastes like heaven!). The second one is a sweet little cube of chopped dates, pistachios, hazelnuts or walnuts bound by gel. Tip: The Hafiz Mustafa 1864-bakery & coffee shop has been around since 1864 (hence the name) and is an extremely dangerous place if you have a sweet tooth: you’ll be there for hours tasting one heavenly delight after another. Don’t tell us we didn’t warn you! And in defence of all the other sweets bakeries in Istanbul: we’ve tried a couple of them (read: a lot!) and they were all delicious. The Galata Tower has been many things in the past: a light house, a defense tower, an asylum for war captives,an observatory… But most of all it has been one of the most famous landmarks of Istanbul. You’ll find the tower in the Beyoglu-area and if you’re willing to wait until it’s you turn to climb to the top of the tower (there’s always a massive queue), you’ll be treated with some of the best panoramic views of the city. 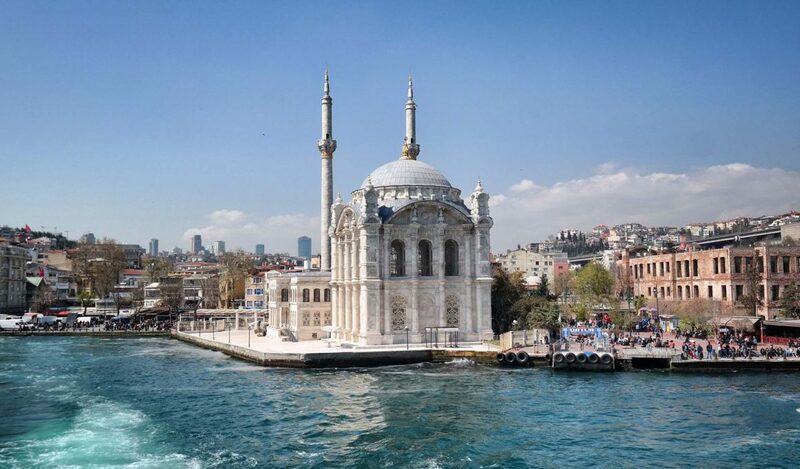 Fun fact: in 1638 a certain Hezarfen Ahmet Çelebi used the tower as a launch platform for…the first human flight. He got himself some artificial wings, jumped from the Tower and flew all the way from the European to the Asian Side. So yes, here you have it: the first intercontinental flight ever! Not something you should plan as a real activity because it takes only a couple of minutes, but if you happen to be in the neighbourhood (and wanting to go from Karakoy to Beyogly), you should try The Tünel, the second oldest underground metro funicular in the world. It has been in continuous service since 1875 and was originally steam-powered. Don’t ride it for the experience (it’s just a ride) but to avoid climbing the 500 meters uphill (change in altitude is 61,5 meters). The funicular line links up with the vintage red nostalgic tram that trundles along the Istaklal Cadessi (Istanbul’s main shopping road) for 1,64 kilometres, connecting Taksim Square with Galatasaray and Tünel Square. Rooftop bars have been booming in Istanbul for some years now and we think it’s the best way to relax after a full day exploring the city. You’ll never forget that amazing 360° view over the city during a sundowner while drinking a cocktail. There are many rooftop bars, just pick one, they all have amazing views. Fancy a night on the town? Istanbul is packed with cocktail bars, jazz cafés, and nightclubs so put on your dancing shoes and show your moves. Most of the nightlife is situated in the Beyoglu district, you’ll have no problem finding what you’re looking for. So here you have it: our tips for visiting Istanbul. Hope you like them and if you think there’s something missing, don’t hesitate to let us know. Cheers! I’ve never been to Istanbul Nina but you have totally sold me! This is a great round up with more than just the obvious famous sights! The hammam and grand bazaar remind me a bit of my Marrakech trip and I know I’d definitely gain more than 2 kg given my love of Baklava! Super post Nina & Jempi! 🙂 I can see that Istanbul had a very similar effect on you, as it did on me. Of course your stay was far longer than mine, officially envious of that! So that meant that you got a fuller feeling and more time to investigate this fabulous city. I loved what I saw, and isn’t it amazing what a different and immense perspective one gets from the water, when on a Bosphorus boat trip. Hi Jackie. Yes, Istanbul blew us away! 🙂 We did stay there for a longer time, but we still feel it was too short. And it’s true: when on a boat trip the perspective changes completely, it’s really a must. We also found the perfect blend between traditions and modernness, between old and new so amazing. Can’t wait to go back and if you have any tips: welcome!